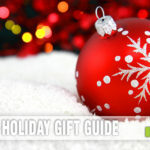 When you’re shopping for a game, what type of theme do you look for? There is no shortage of games about pirates, and zombies are regularly featured in many titles. 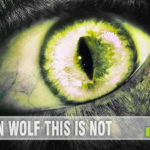 Whether you’re into fantasy characters or looking for something a little more history-based, there is certainly something out there for you. But what if you’re having trouble finding a person to play with who just isn’t into all the “make-believe” personalities showcased in today’s games? Does that mean you’re stuck playing classic Monopoly or Scrabble? Not at all! 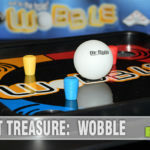 With an industry-estimated 5,000+ new games being issued every year, there has to be something besides aliens and monsters. 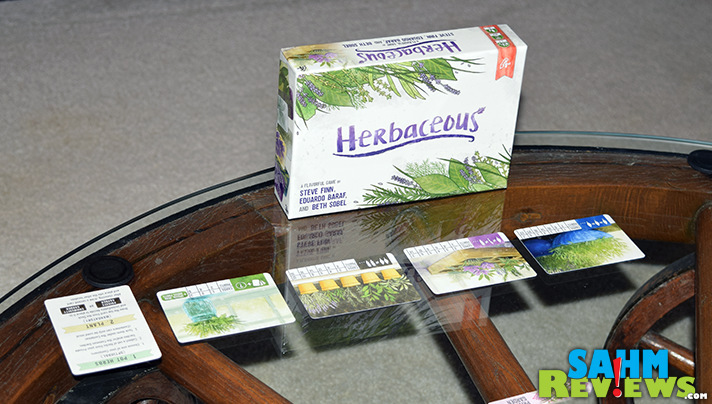 The latest offering from Pencil First Games, Herbaceous, looks to plug that hole. With the seasons turning and home gardens being planted across the country, the timing of Herbaceous couldn’t be better. 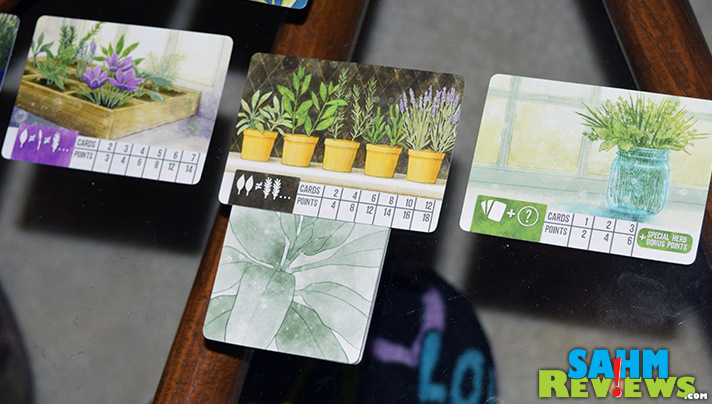 Pencil First Games’ 2017 release is a 20 minute card game centered around the cultivation of herbs in both your own private garden and one shared by the community. Each player’s goal is to earn the most victory points by collecting and potting herbs. 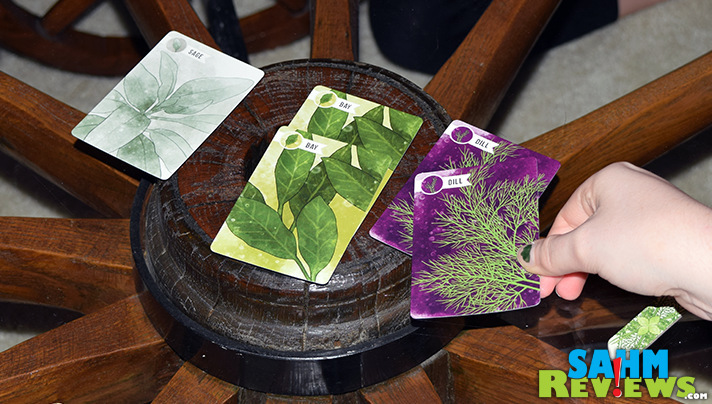 Up to four players each receive four container cards in their color. These different containers will be used to plant your herbs and require different combinations of plants in order to complete successfully. For instance, the large pot simply wants as many of the same type of herb, while the small pots should be filled with pairs of herbs, but as many different pairs as you wish. Unlike many card games, there is no hand to be dealt. On your turn you draw a card and decide to place it in either your own private garden or the community plot. 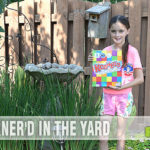 Then draw a second card and put it in the garden you didn’t choose with draw #1. That’s it! Once your garden begins to fill, you’ll want to consider potting the plants. Once per turn (before you draw for the turn) you may take as many plants from both gardens (yours and the community garden) and “plant” them in one of your containers. Each container may only be filled once, so it becomes a push-your-luck mechanic as you try to plant a larger number of cards. The more cards you plant, the more victory points it is worth at the end of the game. There are also three Special Herbs which my only be potted into the Glass Jar container. If you are the first to successfully complete this challenge, you’ll receive the “Herb Biscuit” card, worth an extra five victory points when the scores are tallied. Players take turns until either all containers are filled or it is not possible for anyone to pot anything. If the draw pile is exhausted, play still continues until no more fills can be made. Receive the points listed on each container card depending upon how many cards were planted there. Special Herbs in the Glass Jar award the points shown on the card, along with the Herb Biscuit bonus if awarded. 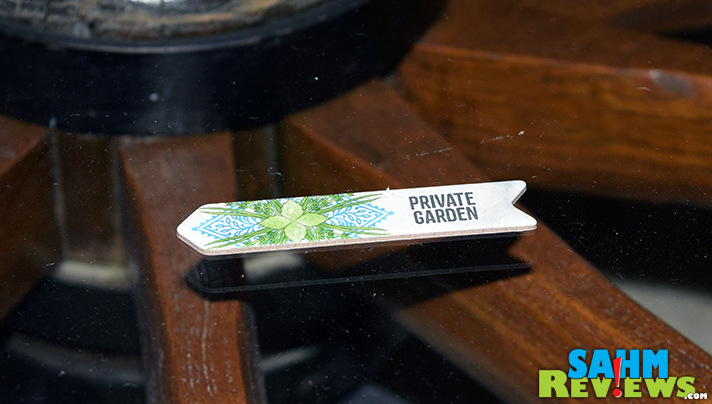 Lastly, receive one point for each unpotted herb in your private garden. The player with the most point wins! I would be remiss in not pointing out the attention to detail and wonderful artwork provided in Herbaceous. The design of the cards screams “relaxation”, the same reasons one works on a home garden to start with. And we chuckled upon seeing the player makers to help keep track of which player is which color – four garden marker-shaped “tokens”! While keeping track of player color isn’t necessary once the game begins, this cute touch just shows the extra mile Pencil First Games is willing to take to create a legacy product. 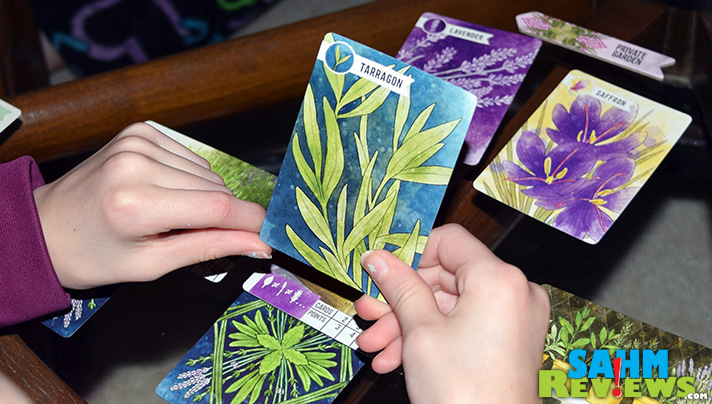 Perfect for all ages, Herbaceous is less than $25 on Amazon. We’re always on the hunt for games that appeal to a casual or non-gamer, and this one fits that bill perfectly. Extremely easy to teach, portable and cute, we’ll be hunting down some card sleeves to keep the game in perfect condition since it will be getting so much play. Be sure to follow Pencil First Games on Facebook and Twitter to see what they’re working on next. Last time we featured them it was all about gems and aliens. This time herbs! I can’t even guess what their theme will be next time, but we cannot wait to find out! 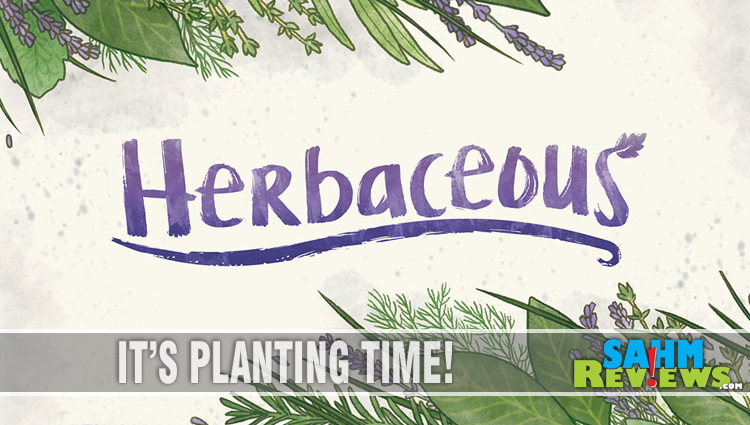 Until then, enter below for a chance to win your very own copy of Herbaceous courtesy of Pencil First Games! Come back tomorrow for additional entry opportunities! 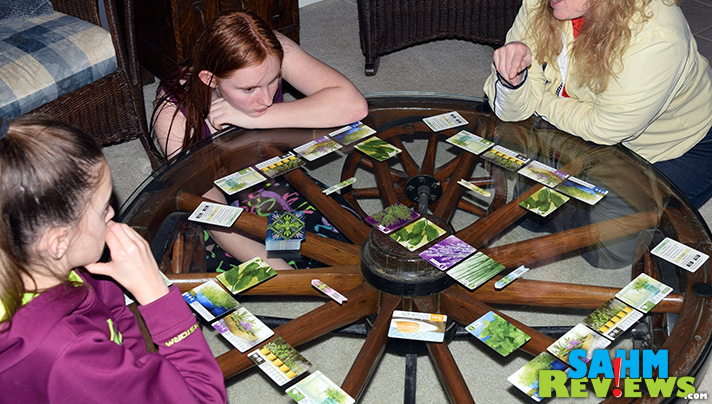 This game look interesting and some of my extended family members do the gardening so it could come in handy for them when in the gaming mood. This looks like a relaxing game. I will be planting more succulents this year. Some schwarzkopf and I’d love to get a couple pachypodium leolis! Like every year I plant onions, potatoes, tomatoes etc But I got some fruit trees as well this year. We’ll be doing some vegetables and a few herbs this year! We live in an apartment and dont have a garden currently, but we know we will have a garden when we get a house! I would love to share this game with all of my friends so they will want to but it! We won’t have a garden this year. Perhaps next year. No garden this year, so I’m not going to be planting anything. Hopefully next year! This game looks nice and calm, its nice to see a fun game that you don’t always have to be fighting some epic battle over. If I had a garden, I would plant peppers, tomatoes and zucchini. I’ve never been able to grow a thing. Except weeds. I’m pretty good at that. We’ll be planting strawberries and raspberries. We will be planting a fruit tree to replace our apple tree that died in the drought. Can’t wait to try this game. It’s so pretty! I don’t have a garden… yet! It looks like we may be moving, so I’ve decided against planting a vegetable garden this year- but in my flower garden Chamomile, rhubarb, lilies, iris’, and one other that the name escapes me are happily growing! Yes, we planted a garden already. No garden this year. We use some to plant peppers.